Infrared thermography, also known as infrared scanning, is used to find areas of excess heat. Problems can be corrected before equipment failure, avoiding damage to the component, safety hazards and productivity loss. Increased heating is a sign of failure and infrared is the best diagnostic tool for finding hot connections during the early stages of degeneration. This form of testing is performed while the system is online, without interruption of service. 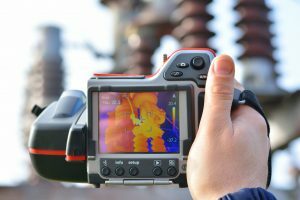 Another key factor is that insurance companies may ask for an electrical infrared inspection, in order to find and prevent problems that could harm occupants, facilities or equipment.